Thanks for the link Phil. It's a great help to see a baker working with their dough. Sometimes I see comment here that the tools we rely on, scales and such, are not needed, that bread has been made for thousands of years without them. What such commenters neglect is that people regularly saw bread being made, handled it themselves and learned what the dough feels like and how it behaves. Clips like this on YouTube are such a gift to those unfamiliar with handling bread dough. 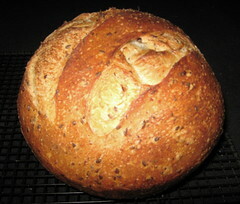 I have it also on my organic einkorn flour. Looks like a European union stars in an organic leaf. Anyone know the name of the flour? Thanks, I see they've a buttermilk rye recipe there too! He didn't preheat his dutch oven? Can someone explain why not? Somebody just posted here a few days ago (or was I surfing back further?) about NOT preheating the DO for Tartine or NKB. They posted pix of beautiful loaves done that way. The topic of not preheating has definitely been discussed in the past. I personally don't like the results as much and I have had definite sticking issues with the loaves glueing themselves to the pan. Not a pretty sight to remove! I suspect the heavy cornmeal serves two pursposes of protecting the bottom from burning and eliminating the sticking problem. I also personally prefer ceramic cloches but that is probably because I have them and they seem to have a slightly "gentler" heat. And I do preheat them to about 450 to 465 dependng on the bread I am baking. A stainless lid is fine. So is a bowl or an aluminum dome from say a roasting pan. All you have to do is trap the moisture - but you would like the size of the dome to be reasonably close to the size of the finished loaf in order to maximize the benefit from the steam. The key is getting a good fit/seal - the better the better! Wow, good point Jay. Anything that seals, yes. And we have some nice deep stainless bowls we bought from Whole Foods because they sit perfectly inside the rim of a (well weighted) 5 gallon bucket -- for providing our dogs with water. I think I'll wash out one of those tomorrow and try that over my my loaf on the stone. One thing about using a pre-heated iron dutch oven as a cover over a baking stone is baking multiple loaves: After one's done I have to put the DO back in to re-heat it. Makes for longer than I'd like to be leaving the oven on. Our power company isn't that needy. I am lucky! I actually have three ovens in my kitchen so I have spare ovens for keeping my cloche lids hot. One of the beauties of a steel bowl is it is thin and has minimal heat up time. And the stone is already hot so!!! Try it! You will (I think) like it! Phil, Thanks for the video. Thanks for the video. It really helps to see him shape the loaf in his unique way. I'm fascinated/mesmerised by his shaping technique ... never seen anyone shape like that before. From what I have read, he is looking into lot of "ancient grains" and developing breads based on them ... we wait and see. I was intrigued that the loaf they showed was baked far short of his Tartine loaves in SF. I preheat my DO when I bake and often got little burns. I bought lined leather welders gloves -- $10 -- that cover your wrist and half your forearm. You can get them at any hardware store. You can't hold a hot dutch oven tightly or for a long time, but for the quick transfer or removal of a lid they're terrific. Easy fix, inexpensive, and no more burns at all. For well over a year I've been baking boules in my cast iron dutch ovens without preheating and I was interested that, in this video, Chad Robertson didn't preheat the DO either. That's a change from the instructions in his book. I don't use proofing baskets. Instead, I let my dough have the final proof directly in the dutch oven. I try to match the volume of the dough to the size of my dutch oven so it fills the pot. Chad Robertson is truly a master baker. Kudos to the OP for the link. Every time I watch it I learn a little bit more. Thanks! I think the camera angle slightly exaggerates the height of the unbaked dough; the top of the boule was just slightly cresting over the top of the DO when it was slashed & loaded into the oven. TFL member ehanner told me the interior height of the lodge 3-qt combo cooker is about 4.25". Although my DO is smaller capacity, it's height is the same as the 3-qt combo cooker (the combo cooker simply has a wider base). 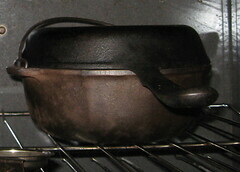 With the skillet as the top, I have an interior height of about 4.5". 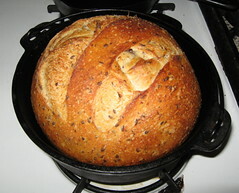 During the bake, I got really nice oven spring though the loaf was very close to the top of the skillet when I uncovered it. Aha. I get it know. Lucky that your skillet makes a worthwhile seal on the DO. Finding a pair that fit so tightly would be pretty tricky. But you've got it...and it obviously works! And you had no trouble with sticking? Do you put corn meal on the bottom and sides? I find that with repeated use there is very little seasoning left in the DO and it's hard to imagine that it doesn't stick. ...I lightly grease the DO with a solid fat (I use home rendered lard; if you're adverse to pig fat you could use butter). This helps the dough rise during the final proof as well as reseasoning my non-enameled DO when the bread bakes. I also scatter a thin layer of coarse corn grits in the bottom of the pot, topped with a round of parchment paper. This prevents sticking and scorching of the loaf's bottom during the bake. In the video (at about the 4 minute 10 second mark) Chad Robertson uses corn meal to prevent sticking (but no parchment paper - master bakers don't need parchment paper!). His dough rises in bannetons so there's no greasing of the pot. proofing in the DO for 2 hrs and then retard it in the fridge for up to 24 hours. I bring it out of the fridge for 1 hour while the oven gets hot (500 F) , I spray my DO with PAM and then line the bottom with parchment before the bread goes in for proof. No sticking and perfect dark brown with a cracked crust. Here is a loaf of St Paddy's day bread I Baked this morning. I thought it interesting that he uses such young starter/levain and has 4 hrs for development as a result. Chad Robertsons says he is using 85% extraction flour. Does anyone know if that is the only flour, or what % he might be using? This is a fairly wild guess, but I think it's safe to assume that the dough in the video is 100% hi-E. His basic Tartine CB formula calls for 9:1 ratio of white to whole wheat. That combo adds up to a hi-E flour. Rather than specify hi-E that many readers wouldn't be able to find, he has you concoct it as a 9:1. Based on that, there's no reason that I can think of to believe he's using anything but hi-E in the Danish masterclass. On the subject of hi-E flours, I ran down a Heartland Mill document online yesterday (from a Destiny Organics website) that gives a bit more detail about some of their flours than Heartland's own website does. On p. 11, they list Golden Buffalo (essentially a hi-E, although Heartland never explicitly calls it that) has having 14% protein. Wow. That's stronger than the label says (~10.5%) on the GB bin at our local food coop. In looking around, I read that a 3rd book by Chad Robertson is in the works, focusing on ancient grains. No info on due date. Thank you for the link for the brilliant video. I only noticed just now. It's so interesting to see how this differs in many ways from the book. The loaves are gorgeous and it's a treat to see him at work. Thanks, Phil! Psychologal researchers have found that people routinely describe processes that can be quite different from what they actually do - a danger with all "instructions". While what Chad does in the video is rather radically different in certain respects from the book, my observation is tempered by the fact that he clearly considered the book a modification of his technique to meet home baking needs. Thus I am left to wonder whether what we saw in the video is closer to what he normally does - or an evolution of his technique???? In any event, I agree the vid is a treat!